Charles Culver, born in Ohop, Washington in 1908 was the first child of his family. According to the 1910 federal census, Charles’ father, also named Charles, was from Iowa, and was 30 in 1910. Josephine Culver, Charles’ mother, was born in Minnesota and was 24 in 1910. Early in his life, Charles completed high school worked as a carpenter. By 1930, he moved to Pacific Grove, California. When Charles was 20 years old, he married Elsie L. Culver, and had a stepson named Jessie J. Rutan. The 1930 census indicated that Culver was a welder at a gas company. Ten years later Culver became a carpenter and earned $480 for 16 weeks of employment. He was divorced. Charles was 32 years old in 1940, and was living with several family members. These members included Josephine Culver, William W. Culver, Edwin W. Culver, Betty Jean Culver, Walter E. Culver, and Carol Culver. When he reported for military service in 1942, he was 5’5” tall and weighed 125 pounds. Washington ranked as one of the top two states in the nation for war contracts per capita. From 1943 to 1944, airplane and ship contracts were valued at three times the total of all manufacturing in the state in 1939. More than $1 billion of contracts were awarded to the Seattle aircraft industry, and over $700 million invested in the the Seattle shipyards. During the war, the state of California, Charles’s state of enlistment, received more than 11% of all U.S. government war contracts, and her plants and workers produced 17% of all war supplies for the U.S. military bases. California’s large agricultural industry had to grow to meet the wartime needs for food. Training camps for the U.S. Army, U.S. Navy, and Marines were stationed in California. California was also a leading manufacturing center. New factories produced steel, airplane parts, and weapons. Also, California manufactured more than any other state. The U.S. home front during World War II encouraged a rationing system, to conserve specific materials such as rubber, steel, and food. Posters encouraged families to support the war effort by purchasing war bonds, growing their own food in Victory Gardens, enlisting in the military, and not spreading false information about the war. Charles Culver was 34 years old when he was drafted into the military on October 29, 1942, from San Francisco, California. Charles Culver entered the military as a private, the lowest rank of the military. Culver was assigned to the 79th Infantry Division, 313th Infantry Regiment. The division that was known as “Baltimore’s Own” because many soldiers came from Baltimore, Maryland. The 313th Infantry Regiment was first ordered into active military service on June 15, 1942, and reorganized at Camp Pickett, Virginia. Charles went through training in five different camps: Camp Pickett, Camp Blanding, Camp Forrest, Camp Laguna, and Camp Phillips, before being deployed with his unit overseas. The 313th Infantry Regiment along with 310th Field Artillery Battalion, were stationed in England at Marsbury Hall and Garswood Park. The 313th Infantry Regiment landed in Normandy on June 14, 1944. They fought through the Cotentin Peninsula, and liberated Cherbourg, a deep water port crucial to Allied success. After helping to secure the Cotentin Peninsula and Cherbourg, the unit pushed south. On July 7, the 313th Infantry Regiment faced heavy artillery file in an attempt to take Hill 84, near La Gossélinerie. Sergeant Charles Culver had two years of his military service, and survived 32 days in combat before his death on July 8, 1944. Culver was awarded a Purple Heart and buried in the Normandy American Cemetery, overlooking Omaha Beach, where he and thousands of his comrades are buried. I did not know Charles personally, but after learning about his sacrifices and bold nature, I am now much closer to him. Through his actions, I am confident in saying that he had a heart of courage. As a child of a U.S. Army veteran, it brings me sadness to learn how Elsie and Jessie never got to see their father and husband after the war concluded. Culver entered the military and joined the 79th Infantry Division, 313th Infantry Regiment, spending almost two years with his comrades. From basic training in Camp Pickett, Virginia, to fighting courageously in Normandy, to the taking of Cherbourg, he put his heart and soul into every moment he had with his brothers. Culver rose through the ranks, from private to sergeant, showcasing his responsibility and dependability. Every time July 8 passes, I will think of the hardships and sacrifices of Culver and those who served to protect the people of his country. For 36 years, Charles was a loving son, brother, husband, and father. For the remainder of time, Charles will also be known as a hero. The purpose of this project was to recognize the hardships and sacrifices Charles L. Culver endured while helping the free world fight for a cause much bigger than himself. The fact that he breathed the same ocean breeze of California’s beaches as me makes Charles relatable. Monterey County is only an hour from where I reside, so a stronger bond between myself and Charles was made while researching him. Even though I never got to meet Charles or his family, my heart goes out to them. Being a child of an U.S. Army veteran, I know that I am blessed to have my father return and it makes me curious as to what life was like for his widow and stepson after his passing. This project was rewarding for me to research and learn about his hard work and dedication. Researching military units I had never heard of before, and accumulating information that is rarely required in a high school project, was rewarding. In many ways, Charles and I are alike, as we both come from a family with many siblings, and both live the southern California lifestyle. I feel as if the personal connection I have established will be with me for a lifetime, for he is someone I hold dear. It astonishes me how millions of American soldiers just like Charles passed during the wars in which this country has fought. It saddens me to learn how his wife and child, Elsie and Jessie, did not have their loving father and husband come home, unlike me where I was blessed to still have a father. This project was more of an opportunity than a simple school project, this project gave me a new perspective on the war, how brutal it was and the sacrifices soldiers made to protect our country. California. Monterey County. 1940 U.S. Federal Census. Digital Images. http://ancestry.com. Charles Culver. Headstone and Interment Records for U.S. Military Cemeteries on Foreign Soil, 1942-1949. Digital Images. http://ancestry.com. 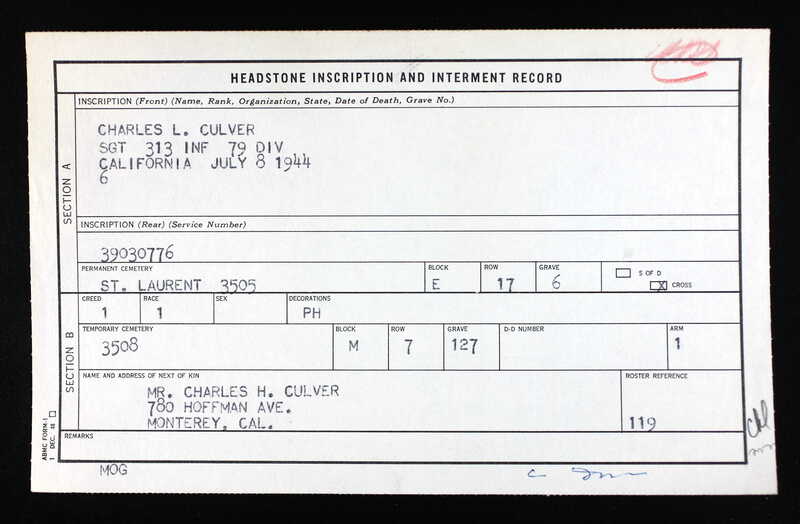 Charles L. Culver; World War II Army Enlistment Records, 1938-1946 [Electronic File], Record Group 64; National Archives and Records Administration [retrieved from the Access to Archival Databases at https://aad.archives.gov/aad/, October 4, 2017]. Washington. Kitsap County. 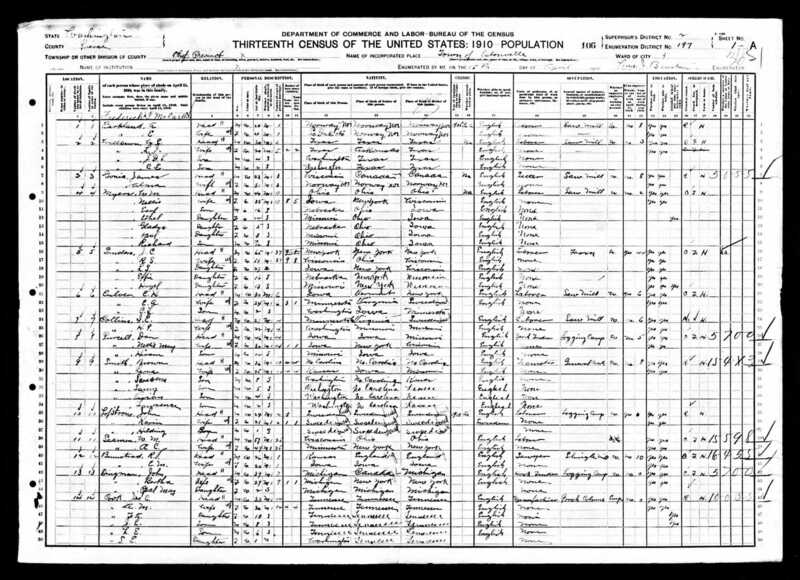 1910 U.S. Federal Census. Digital Images. http://ancestry.com. Washington. Kitsap County. 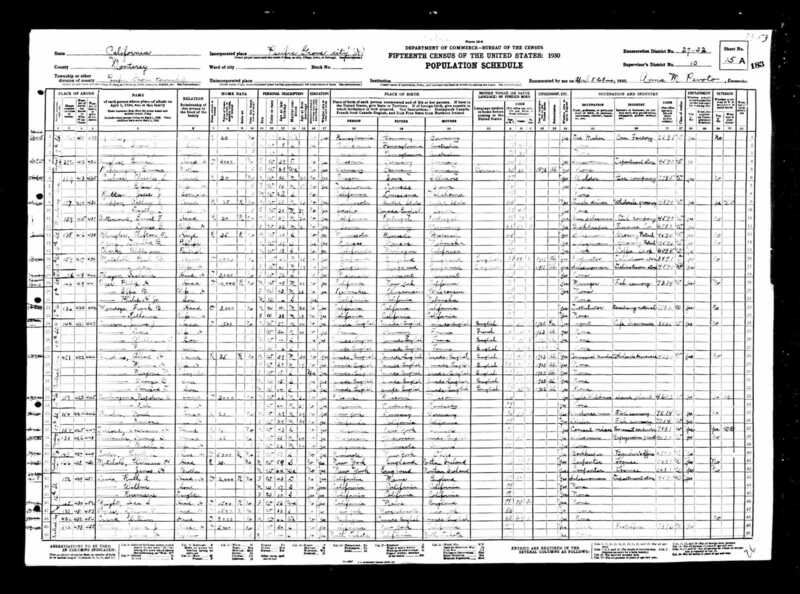 1920 U.S. Federal Census. Digital Images. http://ancestry.com. Washington. Kitsap County. 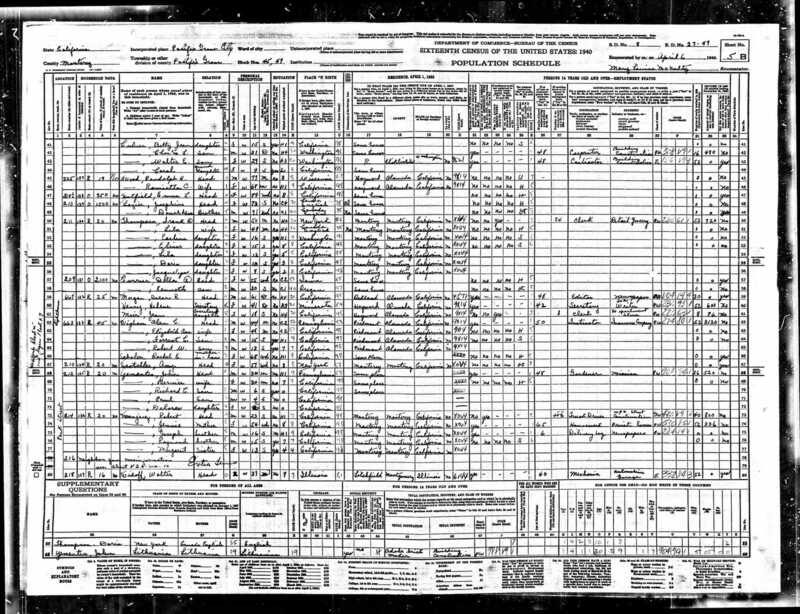 1930 U.S. Federal Census. Digital Images. http://ancestry.com. “Charles L. Culver.” American Battle Monuments Commission. Accessed October 4, 2017. https://abmc.gov/node/408119#.WdVKgmhSzIU. Warren, James R. “World War II Home Front on Puget Sound.” History Link. Updated 1999. Accessed May 19, 2017. http://www.historylink.org/File/1664.